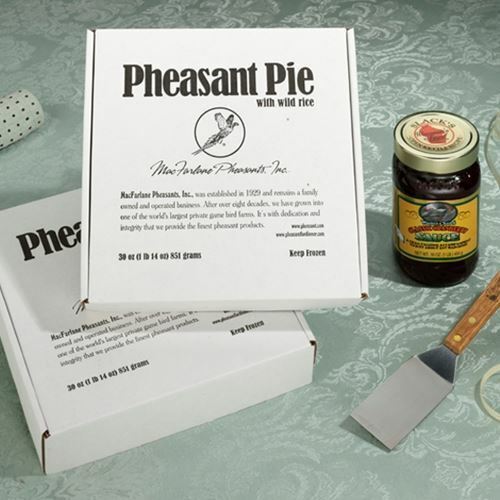 Our Pheasant Pie includes wild rice and has a golden flaky crust. It is filled to the brim with a colorful array of veggies and flavorful pheasant breast meat. Enjoy this easy-to-cook meal that the whole family can enjoy. Because we know this pie will become a favorite, we're offering the pies to you in several packages. We have a 2 pie pack, a 3 pie pack and 2 pies with your choice of 1 oven ready pheasant or 1 smoked pheasant. These will be a great way to send a special gift at the holidays or for a birthday or anniversary. What better way to show your appreciation to someone than with a gift of delicious pie? Each pheasant pot pie is 8 inches in diameter and serves 4. 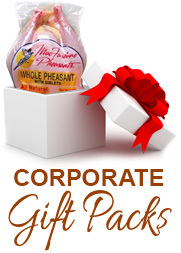 Your customers, vendors and employees will love receiving one of our great Corporate Gift Packs!